Brilliant Mistake - ZineWiki - the history and culture of zines, independent media and the small press. 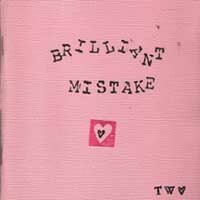 Brilliant Mistake is a perzine out of Chicago, IL, U.S.A. by Carrie. In the first issue Carrie writes mainly about falling for a friend but also about becoming a teacher. The first issue was written as a birthday present for the friend. The zine includes essays and some poetry. The layout is old school cut and paste with a retro kind of design vibe. Issue #2 the "Get Over It Issue" is focused on Carrie getting over the friend she fell for. Same old school retro design and hand embossed cover, the content is angrier but again parts are pretty funny. Reading both you definitely get the spectrum of falling for someone, it not working out, and being good and mad about it. But again, it's clear she cares about the person. This page was last modified on 2 July 2018, at 10:44.